Discover My 'Paint-By-Numbers' Muscle Building System – Learn Exactly How To Blast Through Plateaus And Pack On 25+ Pounds Of Muscular Bodyweight In The Next 90 Days – GUARANTEED! "I'll show you how to plug all your muscle building desires into my instant muscle gain formula. Want an extra 25 lbs. of muscle? Just plug your information into my formula and PRESTO, your body is instantly transformed right before your eyes! " DISCLAIMER: What I'm about to reveal will piss a lot of people off. Supplement companies, bodybuilding magazines, health club owners, GNC, and so called "experts" won't like what I have to say because it turns the muscle building tables in your favor. Once you discover these secrets you won't be at their muscle building mercy anymore! "Gained 43 lbs. Of Muscular Bodyweight!" I just wanted to thank you for your tips and advice that you have given to me since I began training back in October 2003. I am now beginning to have the physique that I have always wanted, my skinny frame has become a distant memory although I still look at photos of myself taken three years ago to remind me not to return that way. I will always either maintain the way I look now, or maybe continue to try to get bigger. When I began training, at 6' 2", I was 187 pounds and very thin, I now weigh 230 pounds and people I have known for a long time comment on how big I look now, which is what I have always wished for. The main reason why I want to thank you is because, like many other beginners, the first two years of my training I just concentrated on having a big upper body, I wanted big arms and that was it, and I was frustrated and writing to you for your advice on how to get big arms. I did train my legs once a week, but my chest, shoulders back and arm workouts were my priority, and I was getting nowhere, my arms grew a bit but not as much as I wanted them to. But just a few months ago, I read your tips on making deadlifts and squats a priority, squatting one and a half times my own bodyweight for 20 reps, and this is what changed my physique. I cannot squat one and a half times my own bodyweight for 20 reps yet, I can do about 4 reps, but making my leg routine my main workout has given me my overall mass, my arms are now becoming huge, forearms especially. This has been a great breakthrough for me, thanks to you, and I hope that there will be others who gain like me through taking your advice. Thanks Lee. Keep up the good work. Imagine that you have an automatic muscle building system at your disposal. Anytime you want to gain muscle you simply switch on your muscle building system and like clockwork you would get the muscle you desired. Need an extra 25 lbs. of muscle in the next 12 weeks? Simply put the system to work for you and now you have an extra 25 lbs. of muscle added to your body. In the next 5 minutes I'll reveal to you the muscle building system that will do just that. "17 lbs. In Just 3 Weeks!" I visited your site a while back and and purchased your e-book and just wanted to send you a quick email to let you know how I'm going with it. I'm from Perth WA (Australia) and had been in the gym for a year without any increase in body mass and only small increase in weights. However, in the first 3 weeks I put on 17 lbs. and have significantly gone up in my weights when I used your Biogenetic plan! My mate has started it to and I'm just as impressed as he is with the results he's getting! My name is Bryan Kernan. You may know me as bodybuilding author, and I'm happy to say I've had some success as one. Not to brag but, I've personally helped over 10,000 bodybuilders worldwide with my bodybuilding nutrition, training, and supplement secrets. I've kept most of my top "breakthrough" muscle building secrets to myself. I did it because quite frankly it's one of the reasons other bodybuilders seek me out for advice. My bread and butter so to speak. Revealing these secrets would be like shooting myself in the foot. I'm now revealing all my top muscle building secrets on instant muscle growth. Why am I doing this now? Because I'm getting out of the bodybuilding industry. Bodybuilding has always been a passion of mine and always will be. But the "swarmy" ways of this industry make me sick to my stomach. I reveal all my jealously guarded muscle building secrets in my new 12-Week weight gain system called The Bio-Genetic Muscle Gain Program. These are the same secrets used by those on the inside to grow muscle quickly and easily without any risk. The Bio-Genetic Muscle Gain Program is a high-speed weight gain program for skinny guys who can't gain weight. The reason it works so well is because it combines nutrition, weight training, and supplements into one powerful program. How to gain as much weight as you want with this "3 x 5 index card trick" . Now you can trick your body's nervous system into gaining all the muscle you want. Want to gain 25 lbs. of muscle? Simply plug your goal into this system and presto your body will automatically reach your goal-without even having to think about it! How to use the 3-Part Ultimate Weight Gain Formula to guarantee your body packs on muscle whether it wants to or not! All successful bodybuilding programs are based on this principle. If you've tried everything and nothing seemed to work you've been violating this rule and here's how to fix that! 9 "anabolically charged natural foods" that will help you gain more muscle than anything else you could use, including creatine, prohormones, and any other bodybuilding supplement on the market! How to use the "customization principle" to over ride your body's desire to stay the same weight. This is the one mistake all bodybuilding nutrition experts make and once you correct it you can easily gain up to 3 lbs. a week! and 90 lbs. on his Squat"
I'm 41 years young and I downloaded and printed the Bio-Genetic Muscle Building Book. I've read it cover to cover. I started working out 2 years ago and I've made some decent gains, but am always wanting more. Since I read your Bio-Genetic Program, I changed my diet and training radically. I'm 4 weeks into this now. The biggest hurdle I've had is getting paste 225 on the flat bench. When I started this program, I could get one, maybe two reps with a spot - now I do 4 or 5 WITHOUT a spot.....7 or 8 with a spot to force them out. Earlier this week, I did 265 for one rep! More than 40 pounds on my bench in 4 weeks. When I started 4 weeks ago, 225 for squats was pushing it. I just did 315 for squats today and it wasn't too hard. People are noticing that I'm putting on alot of size in my chest, shoulders and arms. This program is working! Thanks for the program and all the good info. How would you like to grow new muscle every time you go to the gym? Would you like to be able to see your body change every time you look in the mirror? What is the maximum time limit you should use to stay in the gym. WARNING: If you go over this limit you will actually lose muscle! Did you know there is a small group of supplement companies which produce supplements that give steroid like results? The reason you haven't heard of them before is because they don't advertise heavily in the bodybuilding magazines. "I can't believe you reveal all these secrets. I've never seen another "expert" spill all the beans on how to grow maximum muscle in minimum time. I'm still in shock from your step-by-step formula for instant muscle growth! ." "WOW! I can't believe all of the muscle building secrets I never even knew existed. I can see why the bodybuilding magazines, supplement companies and GNC wouldn't want anyone to get their hands on this muscle building giant. It would make them obsolete!" "Gained 30 lbs. Of Muscular Bodyweight In 3 Months!" "Gained 30 lbs. Of Muscular Bodyweight In 2 Months!" My name is Angelo Soto, and I purchased the Biogenetic Program a couple of months ago. My progress has been excellent, I gained thirty pounds and boosted up my strength all around dramatically. It's an amazing program! Bodyweight In 3 1/2 Months! " I Just wanted to say thanks for all your help. Since I started the Bio Genetic program in the beginning of the new year I have gained 36 pounds and my gains have been 90% lean muscle. "Hardgainer Packs On 25 Pounds!" Your info is excellent. I have gained 25 pounds since April using your programs. I've always been a "hardgainer" or "ectomorph". Tall, thin and a high metabolism. But with the principles I have received from your program I have went from 185 to 210. I've had to buy new clothes. It is a good feeling. "Gained 22 Pounds of Muscle In 12 Weeks!" I am truly satisfied at what I have become within the last 3 months of training on your biogenetic muscle gain program. I have gained 22lbs of muscle, and just become overall much stronger. There's so much information, I couldn't possibly list it all here. And that's why I'm offering you my private collection of 235+ muscle building tips on a completely risk-free basis. 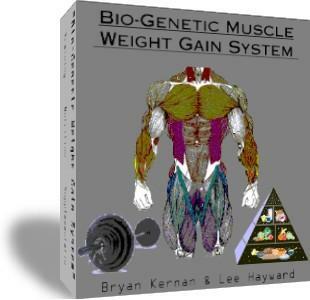 It's my new E-book called the Bio-Genetic Muscle Weight Gain System. It's part of a marketing test that's got my accountant up in arms; he thinks I'm crazy to offer this below our normal risk-free price of $69.95. But because the internet has reduced many of our costs, I'm doing a test and passing our savings on to you. Depending on how it affect sales, we may or may not continue the special discount. And just to make sure I give you more value I'll throw in 5 bonuses valued at $91 if you order today! The Bio-Genetic Program is a complete 12-week nutrition, weight training, and supplement program for gaining muscle weight fast. The program comes in a PDF file. You can view it using adobe acrobat reader which you can get free at www.adobe.com. If you are currently stuck at the same body weight then this is the trick for you. Blast through your weight gain rut and gain at least 1 lb. of muscle per week with this secret. You could be 12 lbs. heavier in the next 12 weeks just from this trick alone! with this secret supplement trick. Impossible? Not when you know this new way to take a scientifically proven supplement. Watch your body change so fast your family, friends, and enemies will wonder what you are on. They will beg you to reveal this secret. Finally, an all natural alternative to steroids! You can see huge strength and muscle gains in a matter of days with this supplement secret. The good news is it's a very cheap supplement. But the way you take it can mean the difference between failure and success. Foods can have a drug-like effect on your body when you know exactly what to do! Discover this secret way to turn your food from a simple nutrient to a muscle producing machine. If you are a terminal hardgainer and have tried absolutely everything to gain weight and nothing seems to work. This report will show you how to consistently pack on muscular bodyweight week after week. Order Now & Get 3 Extra E-books For FREE!!! Where most people make mistakes in trying to develop great abdominals! Abdominal building techniques that really work! How often you should train your abs for best results! Proper nutrition and supplementation for awesome abs! How to lose bodyfat around your mid section! How you can once and for all get the ripped "six pack" abs that you desire! How to get steroid-like results from basic supplements you buy at your local health food store. 4 fat-burning supplements that can help you get to 4-5% bodyfat levels. 2 things you must do with supplements in order to grow massive amounts of muscle. What is better to take, pills or powders? How to use a common vitamin to increase your testosterone levels. What to look for when buying supplements. How to make home made protein bars. How to make home made high protein meal replacement drinks. Donzens of high protein meal recipes. "How To Get Six Pack Abs"
Try my 12-Week Bio-genetic Muscle Gain Program out for a full 60 days, read through the entire e-book, download all of the bonuses, and use the step-by-step worksheets. I'll refund your $37, right there, on the spot! Hurry and order now before the price goes up! With all these power packed muscle building tips I'm going to be raising the price to $59 soon so you must act now! online with the secure ClickBank order form. P.S. : Think about what this inforamtion is worth to you. The $37 you invest is less than 1 supplement bottle and a bargain compared to what it would cost to have a customized weight gain program designed for you from a persoanl trainer let alone an expert like me. 1. You will miss out on a proven weight gain program. Everyone else who orders will get ahead of you by gaining more muscle. When it's time to take your shirt off at the beach you will regret that you didn't order this. 2. The price will rise! That is a fact. I am using the $37 as a promotion price to get started and since this information is in e-book form there are no printing costs for me. But if people start asking for it in hard cover form I might discontinue the e-book and print out a hard copy version. If I do this the price will go up to $97. 3. This offer will not last, but if you order now, you'll be guaranteed to get all future additions and updates at no extra charge and you'll get all bonuses reports too. These alone are worth more than the $37 you will invest. Don't miss out - order now! If you have problems processing your order, please email us. Note: The Bio-Genetic Muscle Building Program is a downloadable e-book. No physical products will be shipped. After you order, you will get INSTANT ACCESS to download the e-book and all the bonus reports onto your computer. The e-book format is adobe acrobat PDF, which can be viewed on Mac or PC.